:: What is UTP Cable? 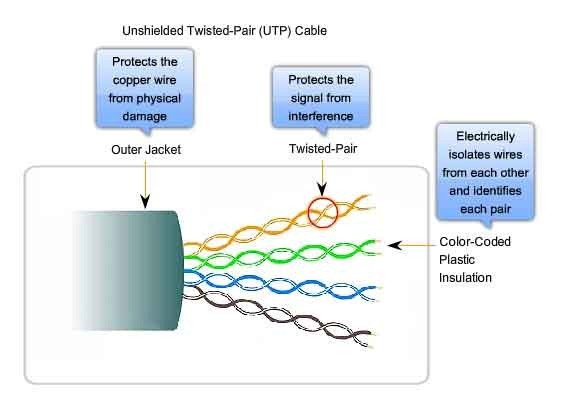 UTP stands for Unshielded Twisted Pair cable. UTP cable is a 100 ohm copper cable that consists of 2 to 1800 unshielded twisted pairs surrounded by an outer jacket. They have no metallic shield. This makes the cable small in diameter but unprotected against electrical interference. The twist helps to improve its immunity to electrical noise and EMI. 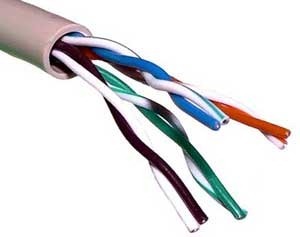 For horizontal cables, the number of pairs is typically 4 pair as shown below. 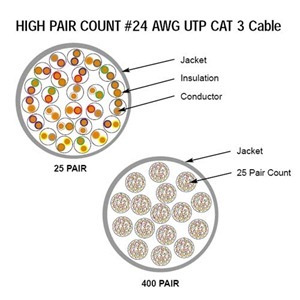 For backbone cables, the number of pairs will typically be some increment of 25, because multi-pair UTP cables are constructed in 25-pair binder group. A sample backbone UTP cable is shown below. The copper conductor of both horizontal and backbone UTP cables are either 22 AWG or 24 AWG. 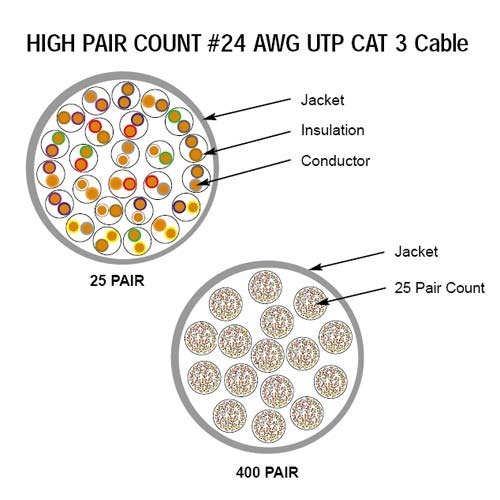 24 AWG is the most common size, but higher-performance cables like Category 6 UTP employ the larger 23 AWG copper wires. As its name implies, solid conductor UTP cables have a single, solid conducting copper wire as the conductor. In addition to being physically stronger and easier to work with, these larger wires have superior electrical characteristics that remain stable over a wider range of frequencies. Solid conductor cables have a lower DC resistance and a lower susceptibility to high-frequency effects based on their larger diameters alone. These properties allow solid conductor cables to support longer transmission runs and higher data rates than their stranded cable counterparts. UTP cables used for both horizontal and backbone applications are typically solid conductor cables. Stranded-conductor UTP cables are typically used as patch cables in either work areas or telecommunication rooms. They are the most common Category-type cables we often directly work with. Inside the twisted pairs of a stranded cable, each individual conductor is made up of a bundle of smaller-gauge wire strands. 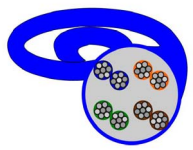 These are arranged so that several wires (commonly 6 or 18) surround a single wire at the bundle’s center. The outer wires are wrapped helically around the central wire through a process called stranding. The stranded wires together form a single conductor with an overall diameter about the same as that of a conductor in a solid cable, but with a much smaller conducting area (based on the smaller diameters of the conducting wire strands). The stranding of the wire conductors serves to protect them, and gives stranded cables their flexibility. UTP cables are mostly used for LAN networks. They can be used for voice, low-speed data, high-speed data, audio and paging systems, and building automation and control systems. UTP cable can be used in both the horizontal and backbone cabling subsystems. UTP cables were invented for voice applications. Voice UTP cables only needed to carry analog signals which are very robust and not easily corrupted by electrical noise or EMI. However, as UTP cables were used for different systems, higher quality UTP cables were required to support data systems that used digital signaling. As the applications evolved, different categories or grades of UTP cables were created along these years. Higher category UTP cables are referred to as data grade UTP cables, and low category UTP cables are referred to as voice grade UTP cables. The following table shows different Category UTP cables, their business applications and corresponding performance specification. Cat 1 cable is used in earlier times. It is used for typically voice networks that carries only voice traffic example telephones. 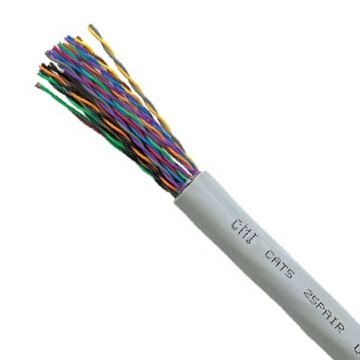 Anixter Level 2 (Cat 2) was a grade of UTP cable capable of transmitting data at up to 4 Mbit/s. It is the first cable which can transmit voice and data up to 4mbps. Anixter Level 2 cable was frequently used on ARCnet and 4 Mbit/s token ring networks, it is also used in telephone networks but it is no longer commonly used. Horizontal UTP cable is four-pair construction by industry cabling standard. Each pair has two conductors. One wire of the pair is assigned the pair color with a white stripe and the other wire is assigned the color white with the pair color stripe. The table below lists the pair and color code for a four-pair horizontal UTP cable. UTP backbone cables are large, multi-pair cables. These cables are constructed of 25-pair binder groups. Each binder group is individually color coded and each pair within a 25-pair binder group is individually color coded. The color code for a 25-pair binder group is shown in the following table. This is shown clearly in the following picture. 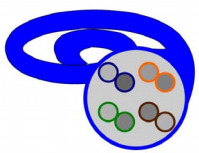 Multi-pair UTP cables that have more than 25 pairs organize the 25-pair binder groups in color-coded groups using the same color-coding sequence. This is shown in the following table. Four-pair UTP horizontal cables are terminated with an 8-position modular connector in the work area as shown below. 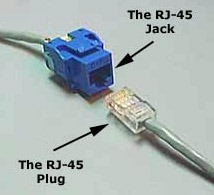 The RJ45 jack is an 8-conductor, compact, modular jack used to terminate UTP data cable. RJ45 jacks are engineered to maintain specific Category 5, 5e, 6, or 6A performance, and therefore must match the category of the cable they are terminating. When we refer to a jack or patch panel’s wiring connection, we refer to either the 568A or 568B wiring scheme. 568A and 568B wiring scheme define the pin-pair assignments for terminating UTP cable. These assignments define the pinout, or order of connections, for wires in 8P8C eight-pin modular connector plugs and sockets. In UTP cable, each pair is represented by a specific color. Pair 1 is Blue, Pair 2 is Orange, Pair 3 is Green, and Pair 4 is Brown. In each pair, one wire is a solid color, and the other is predominantly white with a color stripe. 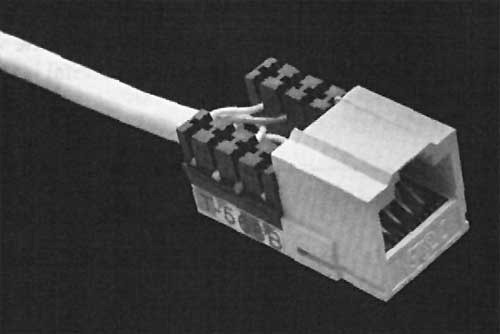 When terminating UTP cable, each pair corresponds to a specific pin on the IDC contacts of the jack or patch panel. The following charts illustrate the difference between 568A and 568B wiring scheme. Notice that the only difference between 568A and 568B is that pairs 2 and 3 (orange and green) are swapped. 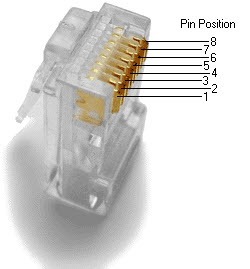 Both configurations wire the pins “straight through”, i.e., pins 1 through 8 on one end are connected to pins 1 through 8 on the other end. One can use cables wired according to either configuration in the same installation without significant problem. The primary thing one has to be careful is not to accidentally wire the ends of the same cable according to different configurations.